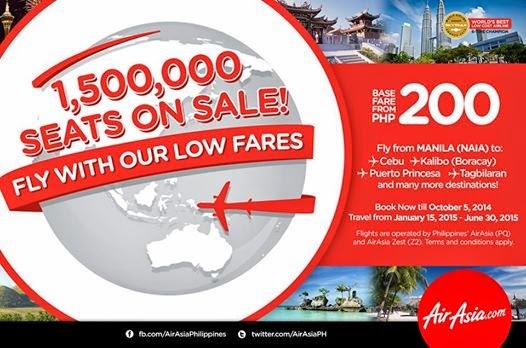 Air Asia Promos 2019 to 2020: Php 200 Base Fare from Air Asia Zest! Air Asia Promo 2015: We’ve got something BIG for you! You know we’re giving you low fares, but you don’t know how many are up for grabs. This week, we’re not just giving you tens, hundreds or thousands; we’re giving you 1.5 Million Seats on Sale to fly across Asia and Australia! Book now at http://bit.ly/1v7CaQS! Fly to/from Manila, Cebu, Kalibo (Boracay), Clark, Kuala Lumpur, Seoul (Incheon) and many more from as low as P200 base fare only! You can also fly across Asia and Australia – from Melbourne, Sydney, Cambodia, Bangkok and many more via Kuala Lumpur! Book now at http://bit.ly/1v7CaQS and pay by using your credit/debit cards or pay cash via our payment partners: 7-Eleven, Bayad Center, Cebuana Lhuillier, Robinsons Department Store, ECPAY and SM City Malls. So what are you waiting for? Grab as many as you can and fly to your dream destinations with our low fares! ‘Share’ this with your family and friends now!